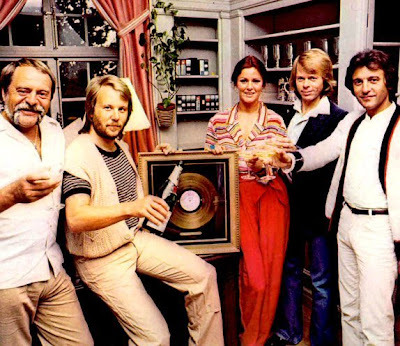 Frida, Benny and Bjorn (new mama Agnetha being at home with the children) with Stig Anderson and musical legend Alain Boubill at Middem fair in Cannes in January 1978 to promote ABBA The Movie (and receive a gold record). LOL! That some guy is Alain Boubill who wrote the lyrics to ABBACADABRA in 1983. He wrote the French lyrics for Waterloo. He also wrote Les Miserables & Miss Saigon. Wow you are not only good but also fast! I posted this 15 minutes ago! Thanks so much and I will add your info! I know who Alain is; had no idea what he looked like, haha! ABBA live on stage during their 1977 tour.